The choice of exterior wood finishes is dependent on the manner in which it will be used. All-acrylic latex paints are the most durable house paints, but oil-based paint films usually provide the best protection from water and water vapor. Although latex paints allow water to pass through more readily, they adhere better when wood swells and shrinks. High-gloss paints last longer than low-gloss paints, because they contain more paint resin and less pigment. 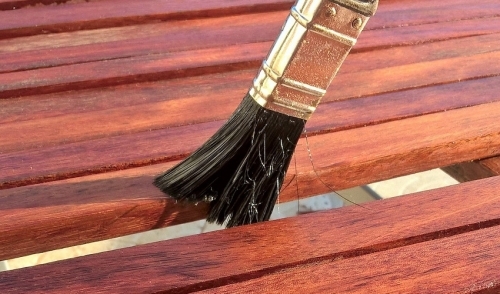 Solid-color stains are best for textured or rough-sawn lumber, and over existing paints. Water-repellent preservatives prevent warping and checking. Water-repellent preservatives that are paintable decrease the shrinking and swelling of wood by preventing dew and rain from penetrating the wood. Semi-transparent stains that are oil or alkyd-based won’t hide the wood grain or trap moisture in the wood, thus the stains won’t blister or peel. The best solvent-borne penetrating stains contain a fungicide, protection from ultraviolet radiation, and a water repellent.